and 11th century (bottom inset).
. Buddha of India was Black, that's why his woolly hair is always shown in small tight curls ­pepper corn style, or in corn rows. 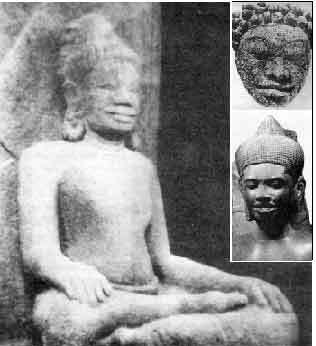 Early sculptures of him clearly portray his Africoid features of wide nose and full lips. "Buddha was adored as a square black stone." 1 In the most ancient temples of Asia and India, the sculptures of the gods and goddesses have Africoid features and woolly hair in pepper corn style and even dredlocks. Kar of Afrika's Nile Valley was the inner soul of Mother Earth, a beautiful ebony virgin who was the "Heart of the World. "4 Shrines of Karnak in Egypt and Carnac in Brittany were dedicated to Kar, the Goddess of Agriculture, especially the growth of grain. She was Kore to the Arabs and Greeks, Ceres to the Romans. Derivatives of her name include cereal, corn, kernel, cardia (heart), care, and cherish. If you cut an apple transversely, you will discover that every apple has a "Kore," the magic pentacle which is her symbol. Moses was Black according to Mohammedan tradition and early portraits. His hand would turn white, then back to his "other flesh" when God wished to give him a sign (Exo. 4:6,7). Apollo was Black and woolly-haired like his father Zeus. The world famous Apollo Theatre in Harlem is named after him. 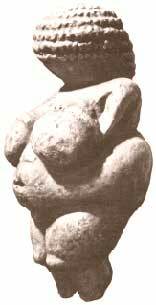 Venus of Willendorf is a famous stature of the Mother God as she was worshipped some 15 to 20 thousand years ago. Although she is found in most art history books, none mention that she is Africoid: her entire faceless head is covered with woolly hair like that of Buddha's. 1) Higgens, v-I, 137. 2) Doane, 534. 3) Ibid. 4) Walker, WE, 514..
Krishna of India was "blue-black." His name means black or The Black One! He is always portrayed with black or blue skin, and his hair was woolly according to the Cambridge Encyclopedia,1 and sometimes locked. Isis (As-t) the greatest of Afrikan Goddesses, was worshipped throughout the ancient world in Egypt, Greece, Rome and beyond. Known under many names, She was the "Queen of Heaven" and the "Goddess from whom all becoming arose." The worship of Her survives today, disguised as the worship of the Black Madonna throughout Catholic Europe. Zeus, the top god and father of gods in Greek mythology, was Black and woolly haired, having originated in Afrika. His chief title was Ethiops (burnt faced). Ixliton, the name of a Mexican god, means "black faced." 13 Many ancient Mexican gods are portrayed jet black with Africoid features. Kali was the Great Black Mother, the Hindu Triple Goddess of Creation, Preservation, and Destruction. Historian Sir Godfrey Higgens wrote, "the originals of all the Gods have been of the black race. "14 The ancients viewed the sacred image of the Divine as Black. And woolly hair was a sign of divinity ­called "the hair of the gods." 15 In the next section, we shall discover why. 1) Rogers, SR, 266. 2) Van Sertima, APEE, 229. 3) Walker, WE, 74. 4) Doane, 120. 5) Walker, WE, 901. 6) Ibid., 131-132. 7) Rogers, SR, 266. 8) Van Sertima, TCBC, 76. 9) Rogers, SR, 265. 10) Kush, 91. 11) Rogers, SR, 266; Temple, SM, 144. 12) Van Sertima, APEE, 214. 13) Rogers, SR, 270. 14) Higgens, vII, 363. 15) Rogers, SR, 70. 16) Hatonn, PC, 32..